The Cyc Bicrac™ designer cycle rack stirs some fun into cycle parking by combining a rider and cycle into a surprisingly functional bike rack. These racks are perfect for river walks, downtown areas and more! Line your downtown sidewalk with these cheerful cycle racks. The distinctive design of the Cyc Bicrac™ makes it an excellent choice for sidewalk installation since it will allow cycles to only be parked parallel to it, keeping a clear path for pedestrians. The Cyc Bicrac™ cycle rack is available in both in-ground and surface mount options. 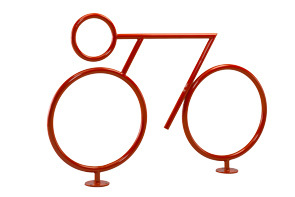 Each cycle rack is available in galvanized steel, powder-coated steel or powder-coated stainless steel. Drop In Anchors available for concrete installation.